Hey Ags… let’s do lunch! Game watching party this Saturday at 11 am at Corner Pub in Brentwood! We have reserved the private room to watch the game together. Join us for fun, food, drinks and FOOTBALL!!! Oh yeah, and it is family friendly! First off, a huge thank you to everyone who came out on Saturday night. I love that we over flowed into the main seating area! Like I said that night, I’m very happy to have been so wrong on the headcount guess. And it was wonderful to see a lot of new faces! I hope to see you all again soon! We will be back at Corner Pub the next two weeks for sure. That private room was already booked this Saturday (Sept. 12) but I’ve reserved a section of the patio for us. It took some negotiating, but they’ve said we can have sound and they’ll reserve a big section of the patio for us. THE MORE THE BETTER. So if you’re on the fence about coming, I encourage you to come on out! At this time, the temps should be perfect for an evening on the patio watching our Aggies in the newly renovated Kyle Field take on Ball State. Game kicks off once again at 6 pm. 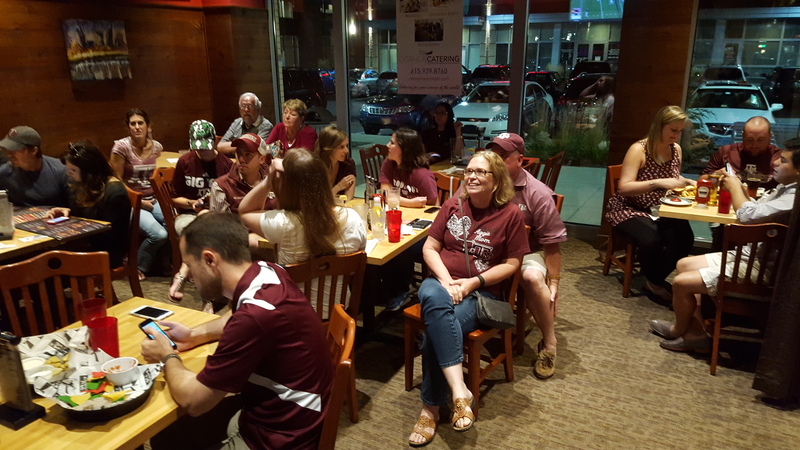 Lets kick off the 2015 Texas Aggie Football Season at Corner Pub Brentwood THIS SATURDAY NIGHT at 6 pm! We have reserved the private room for the evening to watch the game together. The room is under Denise Mattox ’03 (in case you are early and they ask for any reason who you are with.) Join us for fun, food, drinks and FOOTBALL!! !